Adams & Adams offers a large selection of used pinball machines. If we don't stock it we can get it. 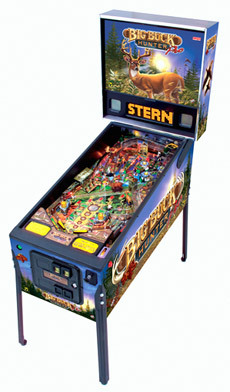 The greatest pirate adventure of all-time is now the latest pinball machine from Stern Pinball, Inc. Disney's Pirates of the Caribbean pinball features exciting elements from the first movie, as well as the box office record-breaking, Disney's Pirates of the Caribbean/Dead Man's Chest. For those fans of the movies, Disney's Pirates of the Caribbean pinball machine adapts the characters and settings from the two Disney films perfectly into a pinball playfield. Two former Williams' developers designed Disney's Pirates of the Caribbean, game designer Dennis Nordman and rules designer/software engineer Dwight Sullivan. "Disney's Pirates of the Caribbean is the perfect title and theme for a pinball," Gary Stern says. "It lends itself to lots of mechanical action pinball shots and toys for casual players, yet the story cries for deep rules to challenge the best players." The goal of Disney's Pirates of the Caribbean pinball is to go on a pirate adventure to defeat Davy Jones, Jack's nemesis in Disney's Pirates of the Caribbean/Dead Man's Chest. 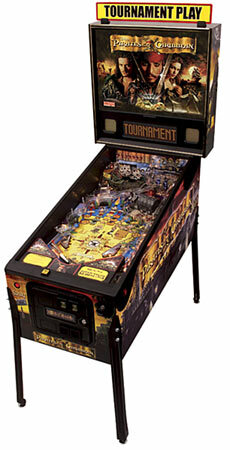 A mechanical pirate ship that the player strikes with the pinball. With each hit, the ship lowers its sails and eventually sinks into the playfield, thus revealing a shot into the Kraken's mouth. In this area, the player can sink the ship, destroy the Kraken, and fight Davy Jones. A mechanical treasures chest, the Dead Man's Chest, through which the player can shoot the ball. When the player has the KEY, the chest opens. They can then spell H-E-A-R-T to begin HEART multi-ball. A contained spinning rubber disk where the player can capture up to three pinballs. The disk bounces them around in the contained area and holds them for an extended period of time till the player starts multi-ball. The disk sometimes represents Tortuga and other times Port Royal. A map compass comprised of playfield inserts that shows the player each feature they need to finish. Complete all eight features and play Four Winds Multi-ball. © Adams & Adams, all rights reserved.